Hotel Magnolia has partnered with ASSA ABLOY Hospitality to implement state-of-the-art security and maximize guest convenience with the installation of VingCard Classic RFID door locks. Built in 1929, the property recently completed an extensive two-year long renovation. Hotel Magnolia’s decision to install Classic RFID locks reflects management’s goal of providing guests with the latest amenities, while maintaining its elegant and timeless design. 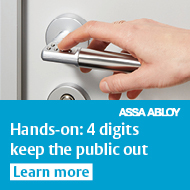 After having considered several competing RFID lock providers, Hotel Magnolia ultimately selected ASSA ABLOY Hospitality’s VingCard Classic RFID electronic lock due to its reputation as a reliable and highly advanced security access solution. Classic RFID uses the latest in data encryption technology to fully safeguard against the ongoing threat of unauthorized keycard cloning. Hotel staff are also able to remotely monitor and control all access attempts made throughout the property. Keycards that are stolen or used in an inappropriate manner can be instantly deactivated in order to minimize or even prevent a security threat from arising. Along with the ability to remotely monitor potential security threats, Classic RFID also allows hotel staff to extend guest stays without the need to visit the front desk for a replacement keycard. Guests can also be remotely re-assigned to another guestroom if needed. With no moving card reader parts, the solution minimizes maintenance issues and offers proven reliability.